Note: This integration is applicable only to the US Edition of Zoho Inventory. Zoho inventory is integrated with QuickBooks Online to make your accounting and inventory management go hand-in-hand. With this seamless integration, QuickBooks customers can easily access all their sales and purchases in Zoho Inventory. Insight: This integration is currently available only in the US edition of Zoho Inventory. Import your accounts and contacts into Zoho Inventory from QuickBooks Online. Export your invoices and bills along with their payments from Zoho Inventory to QuickBooks Online. You must have an active account with QuickBooks Online. 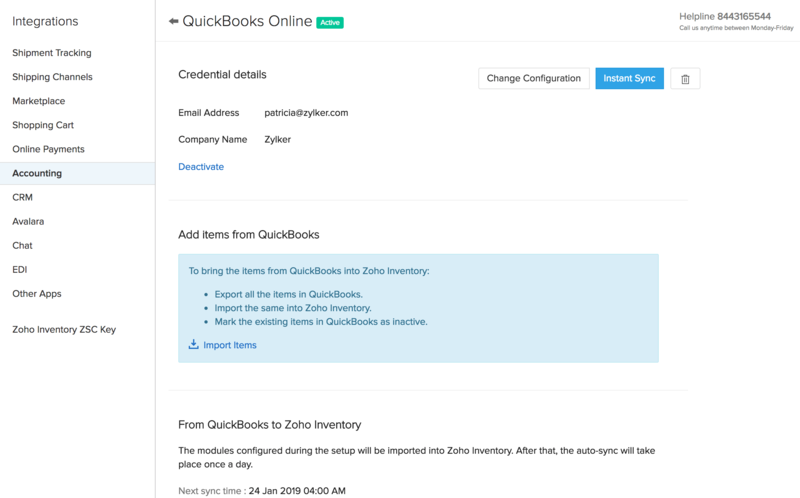 You cannot connect multiple QuickBooks organizations to your Zoho Inventory organization and vice versa. Your QuickBooks organization with which you wish to integrate, must have the country as the US. Ensure that the base currency of both these organizations is the same. If you have enabled multi currency in Zoho Inventory, then you have to enable the same in QuickBooks too. Integrating Zoho Inventory with QuickBooks Online is a simple and straightforward process. Log in to your Zoho Inventory account. Navigate to the Integrations tab on the sidebar. Click the Connect to QuickBooks button next to QuickBooks Online. You will be redirected to QuickBooks Online sign-in page. Enter your credentials to proceed with the integration. Once you sign in to QuickBooks, if you have multiple organizations, you need to select the organization you want to connect with Zoho Inventory. After selecting an organization, click Connect to complete the integration. Once you have connected with QuickBooks, you will be redirected to your Zoho Inventory account to configure the integration. Here, you need to configure the settings to import and export from QuickBooks Online. Accounts: By default, all your accounts in QuickBooks will be imported as accounts in Zoho Inventory.The accounts will be synced both ways, but any changes made to the existing accounts in Zoho Inventory will not be reflected in QuickBooks. Customers: All your customer contact details in QuickBooks will be imported as customers in Zoho Inventory. Vendors: All your vendor contact details in QuickBooks will be imported as vendors in Zoho Inventory. Your existing accounts and contacts in Zoho Inventory will not be affected by the import. All your imports will be automatically reflected in your Zoho Inventory account. Invoices: Both your unpaid and paid invoices in Zoho Inventory will be exported to QuickBooks under Sales. Bills: Both your unpaid and paid bills in Zoho Inventory will be exported to QuickBooks under Expenses. Choose an account from the list of Adjustment Accounts for the corresponding bill or invoice. You can export transactions created with the contacts imported from QuickBooks. If you are exporting a transaction created with a contact in Zoho Inventory, then the contact will be automatically created in QuickBooks with the basic details such as name, phone, email, and address. The underlying items in each invoice or bill that is exported from Zoho Inventory will be created on the fly as Products and Services in QuickBooks. The transactions will be exported to QuickBooks as and when they are created/updated/deleted in Zoho Inventory. To map the taxes, make sure that you have enabled taxes in both Zoho Inventory and QuickBooks Online account. Select an existing tax in Zoho Inventory or create a new one, and then select the corresponding QuickBooks tax to be mapped. Insight: When mapping taxes, ensure that both taxes have the same tax rates. Once the initial setup and configuration is done, click Save to return to the details page. Items in Zoho Inventory does not sync with the items in QuickBooks Online. Export all your items in QuickBooks. Import the same into Zoho Inventory. Mark the existing items in QuickBooks as inactive. After you have configured the integration, you can view the details regarding the integration from the details page. Any new addition to the list of contacts or accounts in QuickBooks will be automatically reflected in your Zoho Inventory account by virtue of the auto-sync that occurs once a day. If you want the change to be reflected in Zoho Inventory immediately, you can click the Instant Sync button. You can change the configurations at any time by clicking Change Configuration. From the details page, you can also check when the next sync will occur, the last synced time, and view the history of all syncs between your Zoho Inventory and QuickBooks Online. Zoho Inventory syncs with the transactions and contacts from QuickBooks Online. The following lists out the sync details. Transactions such as invoices with payments and bills with payments are pushed from Zoho Inventory to QuickBooks Online. The following table lists out how the transactions are synced between Zoho Inventory and QuickBooks Online. Insight: Sales returns cannot be pushed into QuickBooks currently. Invoices created in Zoho Inventory will be exported to QuickBooks Online along with their payments. The following table lists out the fields in Zoho Inventory invoice that are mapped with the one created in QuickBooks. Invoice Number Synced as Invoice No. Bills created in Zoho Inventory will be exported to QuickBooks Online along with their payments. The following table lists out the fields in Zoho Inventory bills that are mapped with the one created in QuickBooks. Bill# Synced as Bill No. Both vendor and customer contact details will be synced from QuickBooks Online to Zoho Inventory. A contact created in QuickBooks as a “Customer” will be imported into Zoho Inventory as a new “Customer”. A contact created in QuickBooks as a “Vendor” will be imported into Zoho Inventory as a new “Vendor”. The following table lists out how each contact’s details are reflected from QuickBooks Online to Zoho Inventory. The stock movements in Zoho Inventory will be recorded in your QuickBooks journal daily. Both the incoming and outgoing changes in stock will be captured in the journal in a consolidated manner. Each line item in the journal will list the debit and credit amount per sale/purchase account for that day. The inventory adjustments that you make in Zoho Inventory will also be recorded in the journal in QuickBooks. Thus, you can avoid manual data entires as your stock movements will be accounted for in the journal automatically. Navigate to Integrations > Accounting. Click the Show Details button across QuickBooks. Insight: You can either choose to deactivate or delete the integration. Your Zoho Inventory account will no longer be in constant sync with your QuickBooks account. To activate the integration again, simply click the Activate button. Click the trash icon in the top right corner. A pop-up will appear on the screen. Click Confirm to remove the integration. However, all your accounts, customers, and vendors from QuickBooks will continue to remain active in Zoho Inventory. Pro Tip: If you want to integrate another Zoho Inventory organization with QuickBooks, you will have to delete the current integration and set it up again with the new organization.